Hello, crafty friends! I hope you all had a nice holiday and enjoyed some time with your family and loved ones. 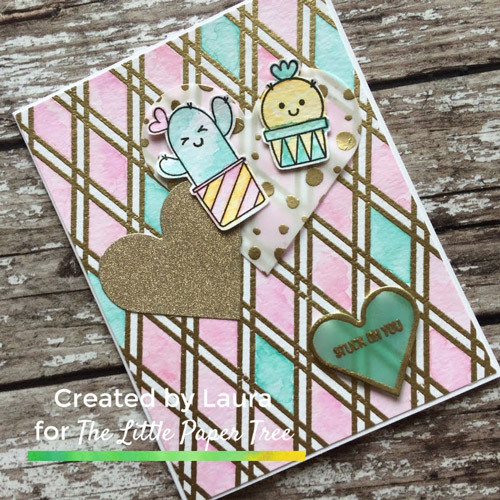 I’m happy to be back today sharing a sweet, little love card featuring Avery Elle’s Stuck On You and Catherine Pooler Designs BFF Background Stamp. I watercolored both the images and the background panel using the beautiful Catherine Pooler Inks. First, I prepped a piece of Ranger Watercolor Cardstock with my powder tool and loaded it into my stamping tool. I stamped the gorgeous Catherine Pooler Designs BFF Background Stamp in Versamark Watermark Ink and heat embossed with gold embossing powder. Next, I used Catherine Pooler Inks (see below for exact colors used!) to watercolour the background and the images. I squished the ink pads right onto my glass work mat (you can also use acrylic blocks, plastic backing, or even a glass cutting board) then used a waterbrush to apply the “paint” to dry watercolor card. All I did was squeeze a bit of water from the brush into each colour, mixed it up a bit, and painted the background panel and the cacti images. If you don’t want two colors to blend (ie: the pink and orange on the flower pot), make sure the one color is completely dry first so you don’t get any accidental muddy colors! I wanted to have softer colours for this design so I started off by laying down a really light base layer(ie: loads of water with just a touch of ink added in). I let it dry completelyand then repeated the process layering different strengths (you adjust by adding/using less water) of the colour right over top of the original colour used. For the additional layers I only added strokes here and there so you could see all of the various shades and where they met and mixed. Once the panel was dry, I ran it through my die machine with just the plates (no dies! )to flatten it back out, then trimmed it down to 4.125” x 5.375” (I wanted a really thin ⅛” border around it!) and adhered to a Catherine Pooler A2 Card Base using Tombow. I fussy cut the cacti images (but it would have been easier with the coordinating dies!) and put them to the side. I needed something to “ground” the images so I die cut a few hearts from both gold glitter card and vellum. On the bigger vellum heart, I used a Versamarker Watermark Pen to add a few dots (in various sizes) and heat embossed it with gold embossing powder. This worked out brilliantly for two reasons: it gave me more gold without it being too much or distracting against the busy background, AND, bonus point becauseit gave me lots of places to hide the glue for adhering it to my card base! Love it when a plan comes together!! I glued the hearts together and then glued the cacti to the top of that before gluing the whole thing to the card base. I did this because it gave me even more places to add glue to the vellum without it showing. Last, I heat embossed the sentiment in gold onto the smallest vellum heart. But I felt it was getting lost on the panel and was missing something. So, I took a blending brush, wiped it over the Aquatini Ink Pad and added a bit of color to the backof the heart. It was still missing something, so I decided to use the Versamarker Pen again. This time I ran it around the edge of the heart and heat embossed that in gold, too. That worked a treat and now I had somewhere to cut super thin strips of 3M foam tape for a bit of depth and added emphasis. And that’s it! Thanks for stopping by today, I hope I was able to provide you with a bit of inspiration. 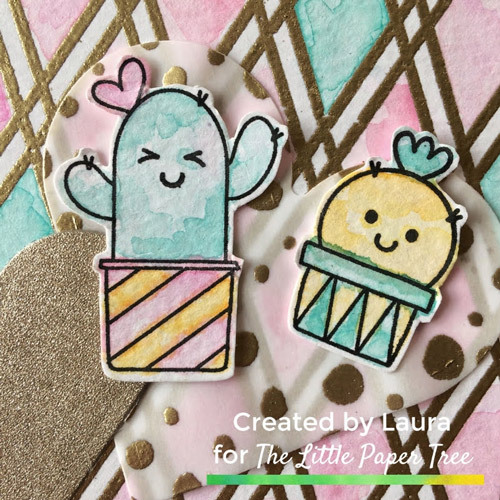 I have used the BFF Background Stamp for SO many cards – I love it. Its such a good stamp to have in your stash and can be used in a variety of ways to create instant glamour! Do you have a favourite stamp in your stash you keep going back to? I’d love to hear about it…enable me!! 😄Have you made anything with the BFF or Stuck On You Stamp? Be sure to share them over in The Little Paper Treehouse Tribe! I love seeing everyone’s beautiful creations!